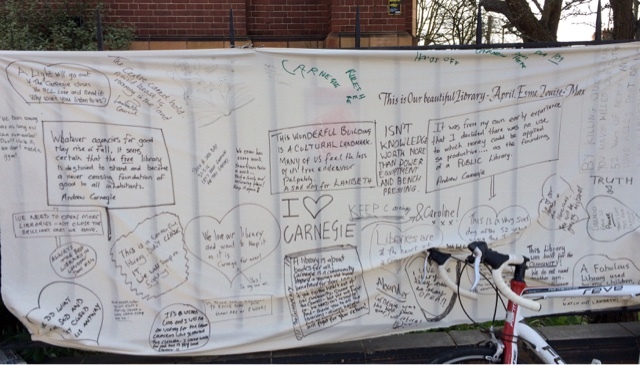 It is now a week since campaigners occupied Carnegie Library (Herne Hill Road SE24) in an attempt to prevent its closure by Lambeth Council. 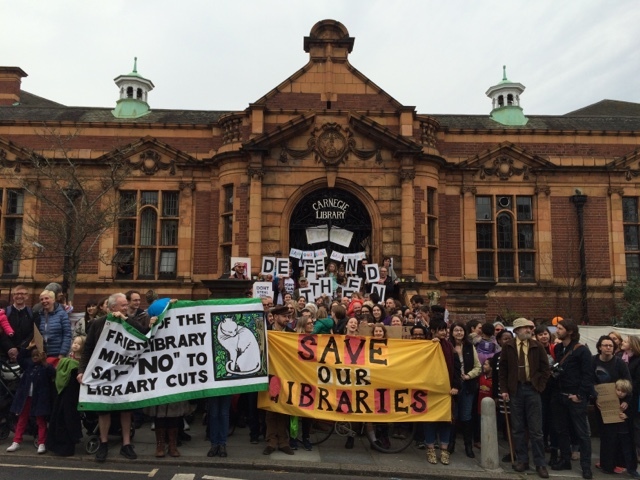 The Council claim the closure is only temporary and that there will be a library there in the future, but it is clear that whatever remains will be a vastly diminished service as much of the building is scheduled to be converted into a gym leaving only an understaffed 'lounge' of books. 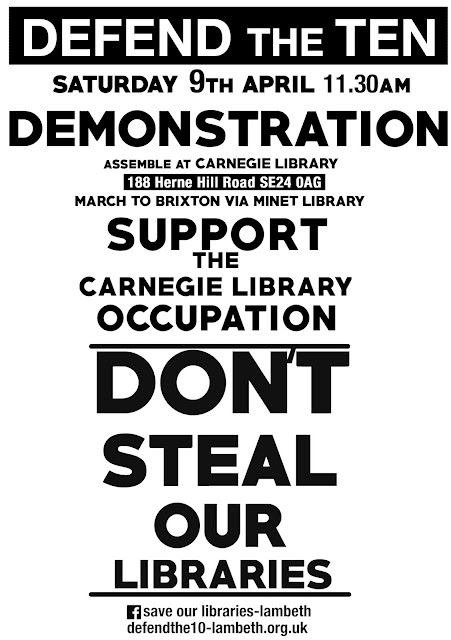 There is a demonstration in support of the library occupation tomorrow - Saturday 9th April, 11:30 am meeting at the library and marching to Brixton via the also closed Minet Library. 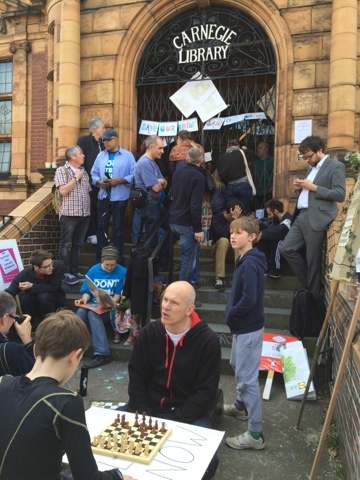 The campaign is called 'Defend the Ten' as there have been ten libraries in Lambeth. 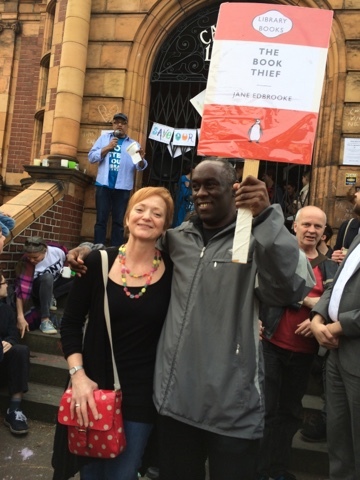 I went along to visit the occupation last Saturday, and was impressed by the support. There were a couple of hundred people outside and a never-ending stream of people bringing food and other supplies to the people inside. There was a toot of support from just about every passing vehicle. The campaign has a strong personal resonance for me, as Carnegie Library (along with West Norwood library and the long closed St Martins Library in Tulse Hill) was the first place I worked in when I moved down to Brixton in 1987. It's a fine old building but more than that it has a central place in the Herne Hill/Loughborough Junction community stretching back over generations. Like many other safe places of sanctuary, study and reading, it is now under threat as a result of overnment funding cuts.